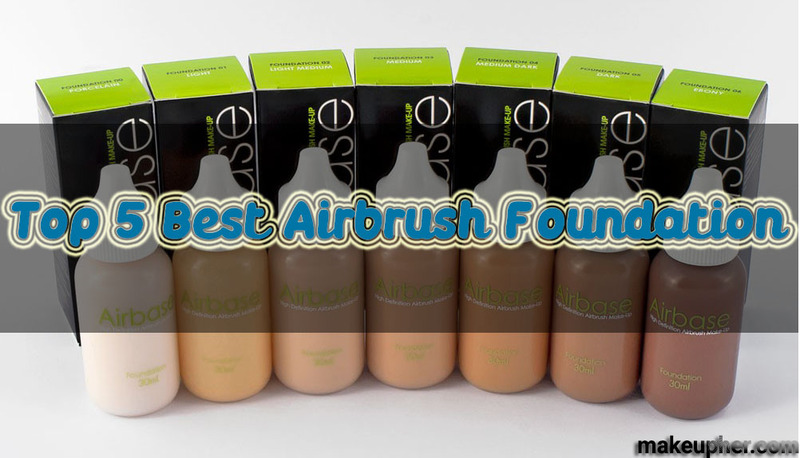 10 Best Airbrush Foundation: Most Reasonable Priced Foundations to Buy! The world of makeup and beauty products is always busy with introducing the best and most advanced technologies. Airbrush foundation is one of the latest techniques to apply foundation to the face and the body. It is basically a foundation that is sprayed on the skin rather than rubbed or applied using a brush or a sponge. Airbrush application should be done using only the best airbrush foundation brands to have the desired flawless look. An airbrush gun is characterized by a compressor that has the power to blow the foundation for controllable and even application through a medical graded hose. The flow could be adjusted for heavier, lighter and more dramatic make up looks. It can be used to apply foundation to the face or different body parts easily and in no time. How to choose the best air brush foundation? It is important to do some research before you buy foundation. Make sure that you are buying a product that is produced by a reputable company. Don’t buy anything that doesn’t have a label or a clear list of ingredients. You must read this before applying any make up to make sure that you are not allergic to any of the ingredients used. Also see if the company’s policies work for you. Some companies vow not to test their makeup products on any animals. If you are a nature lover this will be very important. Make sure that your foundation is clinically approved and tested. People usually provide their honest reviews when it comes to the products they use every day. There are a lot of brands that claim that they offer the best airbrush foundation. Go through the reviews and make sure that they are not made up. People have different preferences or expectations to what their foundation should look like. Consider your main skin and makeup issues and look for a foundation that is specially made to address them. If you are looking for a natural look, then you are better off buying an airbrush foundation that has a medium to light coverage. If you are into a more dramatic and flawless look, then choose a foundation that is full coverage to conceal all the problematic areas. Remember that foundations come in different finishes. The airbrush application will make the foundation application easy but will not change the finish. If you are not comfortable with a dewy satin finish then you can opt for a matt foundation. It is always best to try the foundation on your skin, exactly how you would wear it before you make a purchase. In this case, a brand with an easy return and refund policy will be a big plus. Even the best airbrush foundation will look bad if you don’t buy the right shade. Make sure that you try the foundation on the bottom side of your cheek, where your chin meets your neck. This area is wide enough to see how the foundation will look. Look at your face from different angles and in different lights to see the final result. Airbrush application will even out the foundation but will not fix the shade problem. If you have a fake tan, then make sure that your face matches your tan color. There is nothing worse than a face that looks lighter or darker than the adjacent neck. If you can’t find the right shade, don’t be scared to mix and match, until you find what is best for you. It is always best to use the airbrush gun offered with the particular brand of foundation you are interested in buying. But if you already have the equipment and just looking for a refill, then you must use it to see if they perfectly work together. With foundation, less is usually more. And the best airbrush foundation brands are designed to avoid caking which can ruin even the most perfect make up look. Always apply one thin layer at a time. Avoid unnecessary over application. Only apply extra layers on the areas that require so. Applying airbrush foundation is not hard but it requires some practice. Use a light hand to apply the foundation. Always put some kind of protection on your hair and clothes as you might be spaying it all around at the beginning. 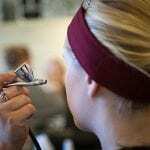 Hold the applicator 4 to 6 inches away from your face and spray evenly. Wait until it dries and see if you need to apply another layer. Comes in 12 different shades: This foundation comes in 12 different shades to suit every skin color and undertone. You must test the foundation on your face to see how it will look in different lights and from different angels. It is non comedogenic: This particular foundation won’t clog your pores and will not cause skin breakouts even if you wear it every day. It is long lasting and will stay put for up to 18 hours. It is water based: This foundation is light and this makes it perfect for everyday use. It doesn’t contain parabens, oils, alcohol or fragrances, making it the best everyday foundation. It hasn’t been tested on animals: It is important to mention that no animals had to go through painful medical procedures to give you this beautiful foundation. Works for all skin types, even sensitive skin. Hasn’t been tested on animals. Some users think that the product is too light. It will work if you are looking for sheer to medium coverage. Comes in 21 different shades: This foundation comes in a wide range of shades that are perfectly designed to match any skin color or undertone. You won’t have a blotchy face or an unnatural look applying this foundation. It will last for 24 hours: This foundation is the best to use for big events where there will be no time or space for touchups. It will last for 24 hours without running or smearing. By the end of the day, you will see that it still looks as fresh as it did long hours ago. It is hypoallergenic: This foundation is water based to be light on your skin. It can be used everyday without irritating your complexion or causing any breakouts or discomfort. It doesn’t contain harmful parabens or alcohol, and it won’t dry your skin after wearing it for long hours. Highly versatile: This incredible foundation can be sheered out for a light coverage or repeatedly applied to get the most even full coverage look. Versatile foundation that can be sheered out or worn in full coverage. Lightweight formula that doesn’t cause any breakouts. Some users complained that they didn’t like the smell of the product. It needs to be shaken very well before every use. Sheer to light coverage: This foundation is designed to provide sheer to light coverage for everyday wear. Water resistant: This foundation is nontransferable and water resistant, and it will last all day even in the hottest weather. You will need no touchups with this amazing foundation because it will stay put for 18 hours and won’t gather in fine lines or stick to dry patches. Natural looking foundation with sheer to medium coverage. Long-lasting wear for up to 18 hours. Sets upon contact without having to use a setting powder. Quite expensive compared to the amount of product you receive. Blendable and buildable: This foundation is highly blendable and buildable to a full coverage that is both flawless and natural. The light formula allows it to finish into a natural finish without being cakey or heavy. The right formula: This foundation is perfect for normal skin. It has the perfect blend of moisturizing formulas and oil control so that it will look perfect even after 18 hours of wear. You can mix several shades for the perfect shade. Buildable from sheer to full coverage with no caking. Has to be set using a setting or loose powder. Long wearing makeup: This oil based mineral foundation is very long wearing and will last a long time. Perfect finish: This foundation can be applied for a heavy look or sheered out for a light coverage. Perfect shades: This foundation comes in 19 different shades to suit all skin colors. Hypoallergenic and fragrance free: This foundation will not irritate your skin no matter how long you wear it. It will need no touchups and will stay perfect all day long. Buildable application from sheer to full coverage. Doesn’t settle into the pores or fine lines. It is not perfect for dry skin. This is the best airbrush foundation for beginners and professionals. It comes with everything that you need, in order to apply flawless makeup and have a fresh polished look. This is a complete kit that helps you create the perfect look for any occasion. The compressor system is very versatile. You can go from sheer to full coverage in a matter of a few minutes. Say goodbye to skin flaws, uneven skin tone, and scars. This airbrush foundation kit features an anti-aging primer that smoothes out your skin and creates the perfect canvas for your makeup application. This primer perfectly conceals the imperfections allowing you to use less makeup. You also receive 6 different shades of fair and medium tones so you can create the perfect shade for your skin. You can also play with the light and shade to contour your face. Because of the lightweight particles, your makeup will not sink into the pores or lines. You will have a flawless makeup that lasts all day long. This hypoallergenic foundation is silicone free and will not cause any breakouts. This comprehensive kit comes with a highlighter, a blusher, and shimmer. You can highlight the top of your cheekbones to help create the perfect bone structure. Whether you are a professional makeup artist or simply want to wear excellent makeup for a special occasion, this is always the kit to pick. The reliable compressor system is very easy to use allowing you to have flawless makeup every single time. You also receive a cleaner to keep your system ready for use. It also comes with an elegant carrying bag so you can take it wherever you want to. Doesn’t settle into fine lines or pores. Versatile application from sheer to full coverage. 6 different shades to create your custom shade. Comes with blusher, highlighter, and shimmer. Doesn’t come with enough instructions. You need to apply a lot of the primer if you have dry or mature skin. This is great makeup for sensitive skin. The kit contains more than 89% of organic water mixed with aloe juice for a gentle and flawless application. The compressor is designed for home users because it is easy to use. Thanks to this versatile and high-quality kit, you can get a professional look at the comfort of your home. The compressor is very quiet, reliable and customizable. It is lightweight so you can use it to create a complete look without feeling any pain or muscle strain. All you have is to turn it on and it will start working instantly. You get to choose between 3 different output pressures to create the makeup look you’ve always wanted. People love how lightweight and comfortable this airbrush foundation is. You receive 3 foundation shades to create the perfect match for your skin tone. The foundation is unique because it contains useful antioxidants that are actually good for your skin. You won’t feel like wearing a mask on top of your face; only your skin but better. It comes with a blusher that will give your face a natural and lovable glow. The best thing about this makeup kit is that it comes with a waterproof sealant. This will keep your makeup stable throughout the day and in different weather conditions. It is the perfect airbrush makeup kit for everyday application and special events. This is cruelty-free makeup which a big bonus. Organic water and aloe juice foundation. Helps you create the perfect shade. Some users didn’t like the smell of the makeup. Applying your makeup doesn’t have to be a difficult job. Thanks to this makeup kit and foundation set, you will be able to apply your makeup like a pro. You receive 4 shades that can be easily mixed. By mixing and matching, you will easily get the perfect shade that matches your skin. The formula is water-based and can be applied in various sheer layers. You can go from sheer to full coverage easily. The foundation is made with natural ingredients that make it almost weightless. You can wear it all day long without feeling like you have something on top of your skin. It has been tested by dermatologists who recommend it to anyone who wants to conceal their skin imperfections and still have healthy looking skin. The airbrush foundation is non-comedogenic, silicone, Paraben and fragrance-free. You can create a complete makeup look using this kit. You can easily use the darker shades to contour your facial features for a polished and sophisticated look. It also comes with a blusher for a natural glow. It comes with a moisturizing anti-aging primer that will erase the wrinkles and the fine lines off your face for a perfect and easy makeup application. This foundation doesn’t settle into your pores or lines so it doesn’t accentuate your imperfections. It is perfect for acne-prone, dry and sensitive skin. It will conceal them without creating an artificial layer on your skin. Can be easily mixed to create the perfect shade for your skin tone. Non-comedogenic formula that is perfect for sensitive and acne-prone skin. This foundation is not waterproof. Have you ever looked at models’ photos and wished if you could have perfect skin like theirs? This skin can be achieved using a lot of photoshop and the right products. This foundation creates the same photoshop effect with a few pumps. Now, you can have the look you’ve always dreamt of in a few minutes. The foundation you receive is designed to give you an airbrush effect without actually having to use an airbrush kit. 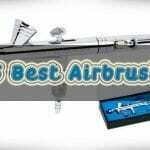 A lot of users consider it to be the best airbrush foundation because it is lightweight and manageable. It evens out the skin tone and visibly improves the look of your fine lines and wrinkles. A few pumps will create a silky film over your face that will last all day. It works for dry and sensitive skin. It will not cling to the dry patches on your skin or make them more visible. As a matter of fact, it is so lightweight yet creamy enough to moisturize your skin while creating the perfect look. A few light sprays are enough to cover your whole face. You can blend the foundation with your regular foundation or stippling brush. You can also use it with a sponge or a beauty blender to create the perfect look. Gives an airbrushed effect for the flawless skin. Doesn’t settle into pores or lines. A few sprays are enough for your face. Application can be messy. You need to use some covering to protect your clothing at the beginning until you get used to using the product. This makeup kit comes with everything that you need to create a professional look. Each set comes with 8 natural-looking shades that you can mix for the perfect shade. The foundation is water-based and is very lightweight. It gives a natural matte finish. The best thing about this foundation kit is that it is perfect for beginners and people who are not very sure about creating the perfect shade. It comes with a complete easy-to-follow guide to help you mix various colors. The shades are based on real skin tone colors and will not look artificial because the foundation applies evenly. It is highly pigmented. Only a few drops are enough to cover the whole face with a perfect layer that will cover moles, birthmarks, hyperpigmentation and discoloration. It works with any airbrush equipment you have. The makeup is longwear and doesn’t oxidize. It doesn’t get darker throughout the day and you will always look fresh. The foundation contains soothing and natural ingredients like jojoba and lavender oil. It is perfect for all skin types including sensitive and acne-prone skin. It doesn’t contain any skin irritants like Paraben or silicone and this means that you can safely wear it all day long. It is almost weightless and extremely hydrating and this is why a lot of people prefer wearing it on a daily basis. Water-based foundation that is perfect for sensitive skin. Different shades to get the perfect match. Longwear and doesn’t oxidize or get darker. It has to be shaken well every now and then because it tends to separate. Going through the best airbrush foundation reviews, we decided that we have a winner. 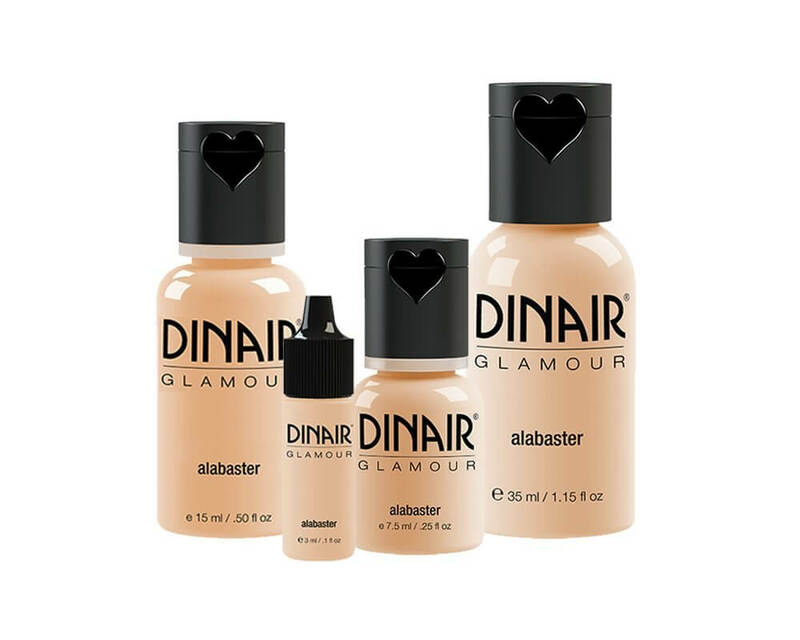 The Dinair Airbrush Makeup Foundation is by far the best choice. It provides the most flawless look with the perfect finish. It even rubs and water-resistant and won’t transfer to your clothes. It sets on contact without powder for a classic look that will last all day.